Thanks for viewing my portfolio and picking out a few things you really like. I can tell right away which of my designs you were most inspired by because you copied them and are now selling them. Fortunately for me you are as unskilled in creating vector graphics as you are in coming up with ideas of your own, so your stuff isn't really competing with mine. But you have still created some problems for me and I have to do something about this. But before I do, I thought you should know why. Because inevitably, whenever I report someone for copying my work, I get that angry email afterwards asking why I'm such an a*****e and why I bothered reporting you. First, save the excuses. I've heard them all. Maybe you think I'll believe that you were just practicing, trying to learn how to do something by copying something else. And that's fine. I've done that myself. But I have never copied something to learn and then inadvertently keyworded it, saved it to various sizes and formats, and then accidentally uploaded it to multiple stock sites and put it up for sale. You may also think I'll believe that you didn't know you couldn't sell other people's work. Or that you didn't think your design looked that much like mine. You were just "inspired" by my work and tried to do your own version. Or if you're especially brazen you may even think anyone will believe that you actually are the original designer of that vector and that I, in fact, copied you. Even though it's pretty easy to prove otherwise. I reuse a lot of elements from my designs in new work. I'll grab an icon I did last year or a graphic from a couple of years ago and work it into a new design. And since often the way that agencies assess cases of possible copying is to simply look at who uploaded the image first, now I could potentially look like the copier if I upload an image with that same graphic at a later date. Now because you copied my work, I'm potentially in danger of having my account with an agency terminated or suspended while they investigate. And although ultimately I'll be able to prove that I was the original artist, I can't take the chance that my accounts could be suspended even for a day. I'm not losing a day's earnings because of you. So go ahead. Call me names, get angry that I reported you. Have at it. But understand that the innocent copying you did, thinking there was no harm in it, puts my livelihood at risk and hurts my ability to reuse stuff that I created and you decided to copy and sell. Maybe you think I really am an a*****e for being so overly protective of some silly clipart or vector icons. But please know that those silly graphics are the result of years of learning, practicing, studying the market and figuring out what sells and what doesn't. It's how my mortgage gets paid and how I pay for the clothes on my kids' backs. It took you just a few minutes to do your sloppy version of my design but it took me 8 years of working at this to get to this point, and I'm not about to let you or anyone else take it away because you felt entitled to copy my work. I like to think I'm not a total a*****e so if this is a situation where it looks like you just copied 1 or 2 things of mine, I'll give you a chance to delete the infringing work, rather than going straight to the agencies and getting your accounts shut down. But that's a one-time, short-term offer to do the right thing. Refuse to remove the copied designs, try to explain why it's not an exact copy, or even refuse to respond to my request in a timely manner, and you're on your own in dealing with the wrath of compliance departments who won't give you the same courtesy I am. If you do manage to come out of this with your microstock accounts still online, consider yourself lucky. Not many people who get caught copying others are able to get their accounts reinstated. Enjoy your good fortune and learn from it. If you are one of those few people who really did have a small lapse in judgement and made this one mistake, and you really do want the chance to build a legit portfolio, don't squander the opportunity. I wish that as photographers we had the same options to go after people who copy our bestsellers. All a copier has to do is change one small thing like lighting, angle or one tiny element and there us nothing we can do about it. Mike's well-written rant and PB's comment have both reminded me of yet another reason why I like "shooting" birds and other wildlife in their natural habitats. Not only do I not need model releases, but also… it would be almost impossible for some amateur, would-be thief to duplicate one of my images. Even if a copier happened to find the exact same wild critter out in nature, the background, lighting, weather, pose, etc, would be virtually impossible to duplicate. Not to mention the different effects obtained by different lenses, most of which are probably too expensive for that sleazy, would-be thief to buy. Honest question, also related to PixelByte's comment, why is it allowed to copy a photograph but not copy a vector? Back when iStock was really an agency (before Getty destroyed it), they had an image of the week that it later turned out was a re-shot and re-posed almost-duplicate of something a different photographer had created. Not only did they replace the image of the week, but I think they closed the contributor's account. There was a lawsuit over a shot of a red double decker bus that a cheap client wouldn't pay the original photographer for, where the copy (not identical shot but same concept) that the cheap client had made was held to infringe the original photographer's copyright. But if you do just the smallest amount of work, you can create something from scratch on your own to try and gather up some sales of popular works - and lots of the top sellers in microstock have done that with some themes and setups that have been used by many other photographers over the years. It isn't copying but it obviously upsets those who were previously selling like crazy and see reduced sales. This is one situation where the right models can help - if the image depends upon the wonderful expressions/face/poses of a particular model, it's harder to recreate for those who want to do that. Is it harder to prove that a photo was copied? Maybe that has something to do with it. Vectors, it's a little more cut and dry most of the time. It's pretty easy in most cases to tell if it's a copy, just inspired, or just in the same theme or style but not derived from something existing. The cases I report, they're usually the most obvious ones. When I can take my graphics and place it over the other person's and cut the opacity and it's exactly the same, that stuff gets reported. I guess they figured if they merged my 2 versions the resulting version would be "original". You may want to attend a shuttertalk video session one day. Yes, there's the problem with painters as well. A huge problem in fact! I have a close friend. One day we were watching my gallery and she got that great idea - she'll paint my images and sell it on PODs. When I told her she can't do this she did her eyes so huge! "What do you mean I can't paint your pictures?! It will be my work then, I'm not stealing yours!" Well, not really. This is still the same work just copied in another form. Thanks Mike, Jo Ann, it seems to be a difficult situation most of the times. Vent all you want Mike, that is partly what this forum is forum no, expressing our concerns with this business. The thing with vectors is that quite often it isn't just a copy of an idea, but a direct theft of the vector by downloading on one of these warez sites or even licensing it then reuploading it as your own. But I have been told that its ok to copy an idea as you cant copyright an idea, or something in those words. Not sure I follow what you're saying here. Bingo it is all explained right there. Well, after it took 45 seconds of nothing to get started, she said she was going to cover copyright, releases and editorial. Nothing about how to protect your images from being stolen by others. What's explained? As it relates to this discussion, people copying other people's work, I don't see the connection. I get that ideas aren't copyrightable, only the expression of the idea is. 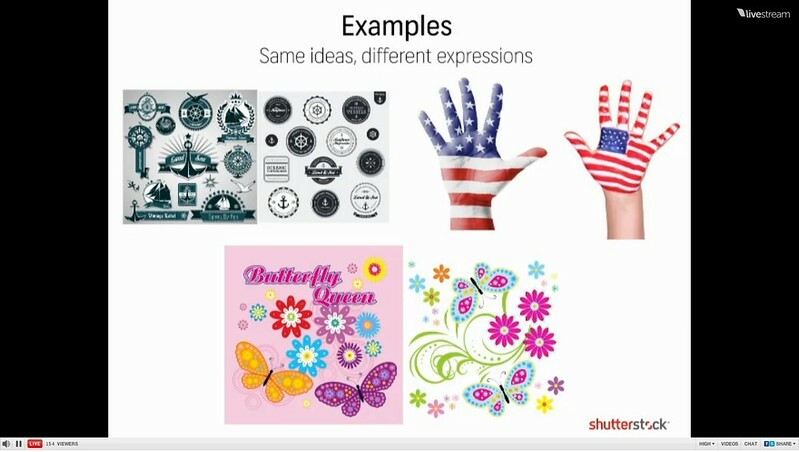 And in the examples shown in that video (ironically one of which is my nautical graphics set) the point is that if things are sufficiently different, they are considered separate works. Which I completely agree with. But I'm not talking about that here. This is about people fully copying my work, to the extent that you could place one image over the other and see that the copied image was clearly traced from the original. If anyone is interested , there is going to be a free live class on Creativelive about protecting copyrihts, licensing etc..is a long class. But after it airs , the class can be purchased to be watched later. On the live class people get to ask questions...Creativelive is a good site, once in a while they have some famous people teaching there, they had Anne Geddes a while ago. I don't have the link handy , but just go to creativelive.com and in the search box look for "intellectual property". I am not affiliated with this site or anything, I just like to watch some of their courses. Copying other people's ideas is a d*#k move tho, unless you do a totally different take on it. I can't say I have a ton of ideas, so if you are copying me, you are probably copying the design. Yeah. I was more thinking of photos. Vectors are much easier to prove copying. D*#k move either way, but photogs seem to get away with it more. How can you get away with something if its legal? If you cant copyright an idea, then making your own version is legal. Ron, my friend, I was making the distinction between legal and ethical. I am sure you understand there is a difference, and that to copy someone else's work and change it just slightly enough to be legal is still unethical. If you don't see the problem here then you are very lucky nobody has copied one of your bestsellers and hurt your income. When it does happen, and it will, then you may agree it is a d*#k move. Bad Behavior has blocked 62522 access attempts in the last 7 days.